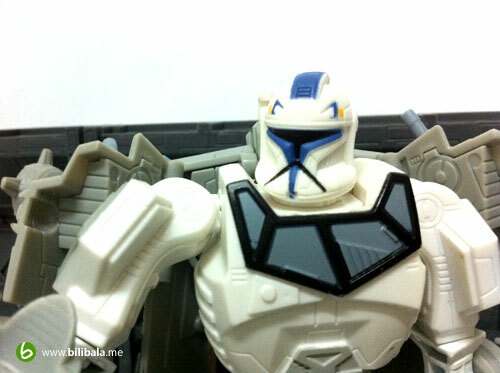 Fancy a Captain Rex alike Transformers? 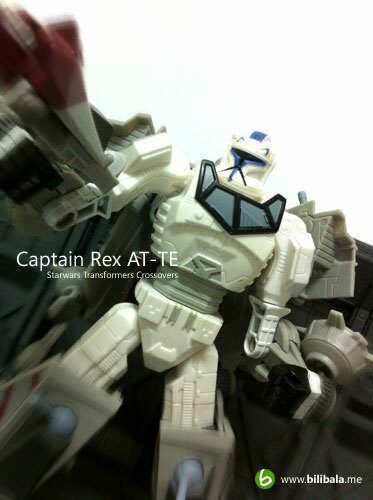 Interested in seeing how a AT-TE (All Terrain Tactical Enforcer) can be transformed into Captain Rex? 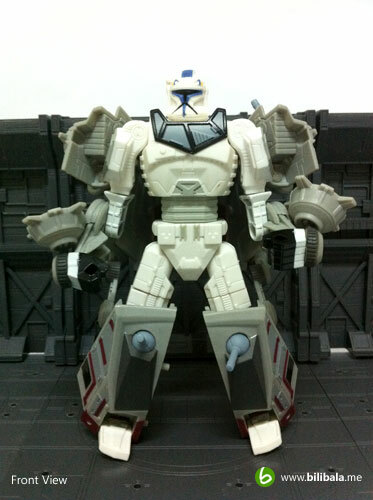 Then this piece of Starwars Transformers crossover is something you might be of interest in. Well, that’s what this line of Transformers is about: the blending of Starwars vehicles with the Transformers robots. Quite a creative and bold approach for mixing them together in my opinion and I particularly fancy this line of Transformers to see how they creatively did it. Read on! 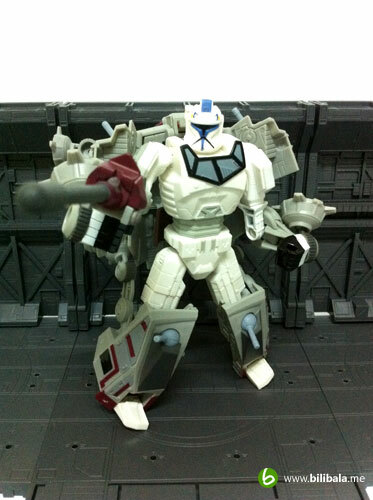 Okay, the alternate mode for Captain Rex is the AT-TE which appears somewhere in the Clone wars or Attack of the clone. More info can be find here if you are interested in the vehicle. 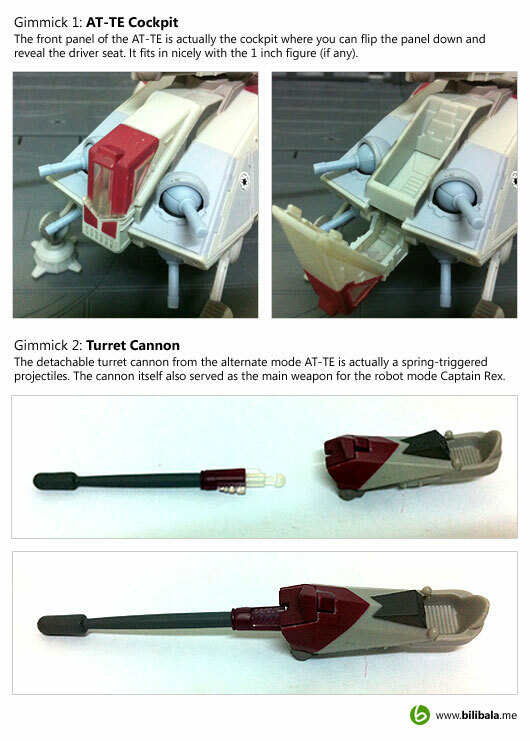 The alternate mode is quite movie accurate and you definitely will see the smaller details such as the 3 pairs of moving limbs, 3 pairs of smaller turrets (which are movable as well in their ball joints) and the main cannon. 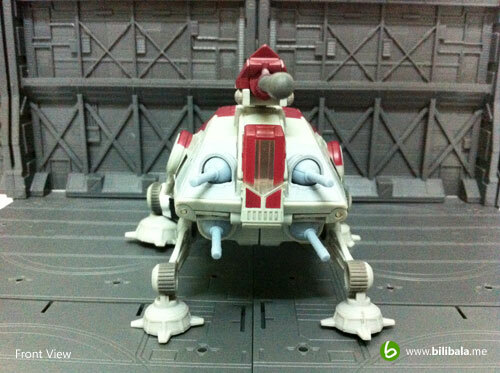 The front part of the AT-TE you will notice there’s a transparent cockpit there which is can be opened to show out the driver seat and to fit in the 1 inch figure (if any). Speaking of which, there is no 1 inch figure bundled with this new version of Starwars Transformers like with my Darth Vader or Luke Skywalker. It will be much cooler if it comes with a 1 inch Stormtrooper. You can notice the 2 pairs of small turrets here and they are movable. A point to note, the ball joints for the small turret are quite loose. I am having a hard time fixing them in a static position. 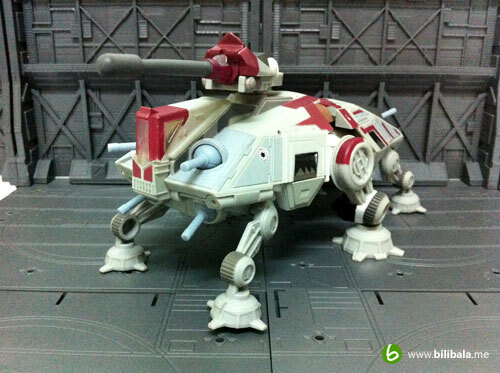 The side profile of the AT-TE reveals details like the windows (which is just painted and can’t be opened) and the mechanical limbs. There’s a small Imperial logo located at the front of the AT-TE. 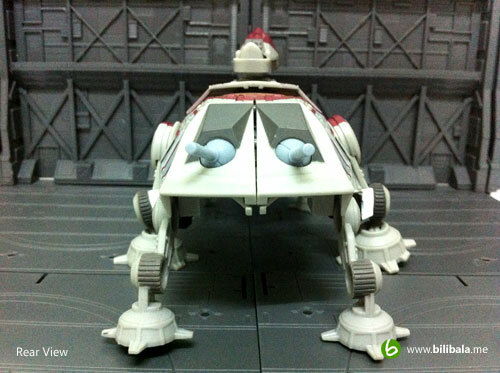 The rear of the AT-TE with the extra pair of the small turrets. 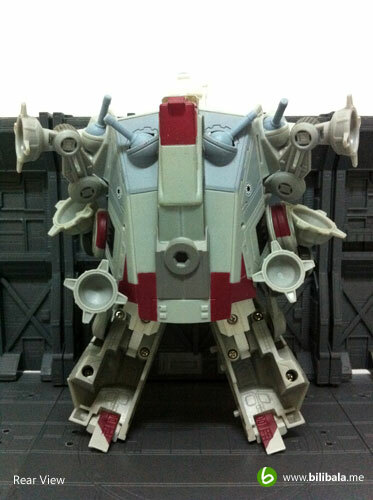 Again, is movable with the ball joints. 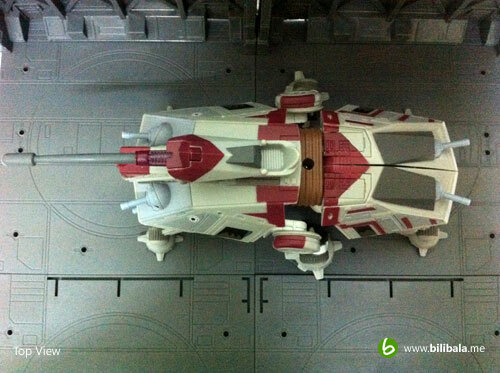 You can notice there’s a seat on the main turret where you can nicely fit in a 1 inch figure there as well. 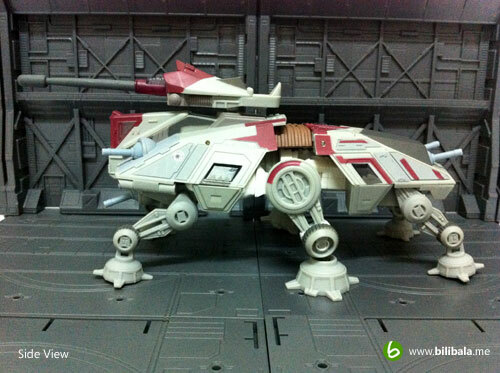 Here you go with the robot mode for the AT-TE. To be frank, the robot mode wasn’t really bad. At least you can see better proportion of the robot as compared to my Snowspeeder Luke Skywalker. 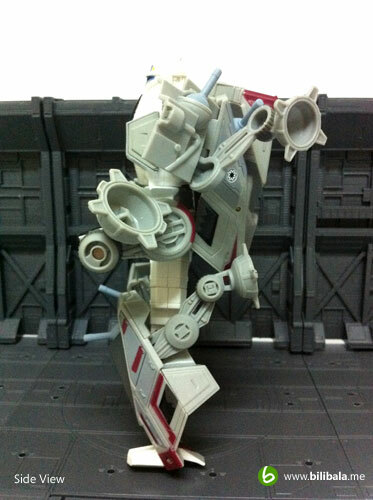 Anyhow, the articulations for the robot is quite standard. A particular point which annoyed me is the upper leg joint which falls off easier when turning them for a better stand point. Basically the overall weight distribution of the robot form is not so well done. You can notice that the upper body holds more of the weight and the leg portion is quite tiny to maintain it. So posing with it might need some adjustments and time. Here’s a close up on the headpiece for Captain Rex. There are no light piping mechanism here. Well, the headpiece is movie accurate though. 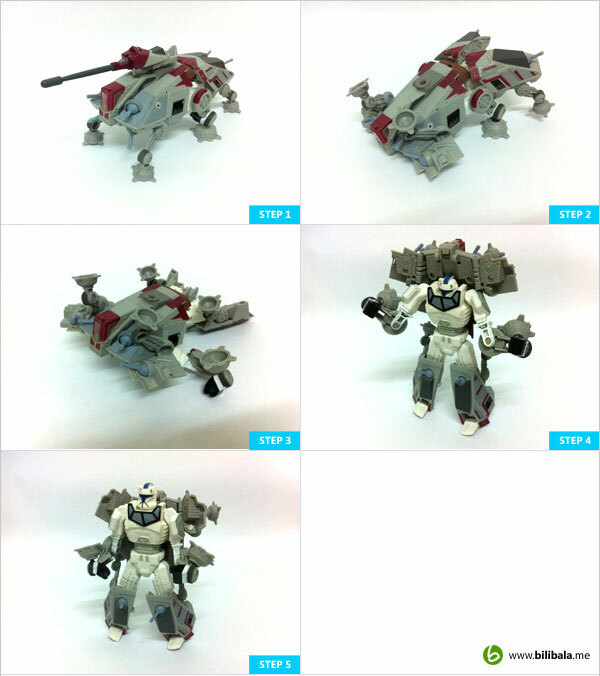 Like all Starwars: Transformers figure, transformation is easy and straightforward. You can pretty much transforming it without a manual.